I made a reference to a Frenchman here earlier this week to "the fires" in the U.S. He responded with, "What fires?" I was dumbfounded. This is a person who listens to the news all the time on his 45-minute commute. 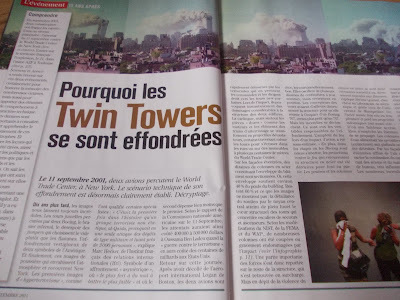 But then he explained that news from the U.S. this week has been focused on the tenth anniversary of l'onze septembre... My neighbor had the same blank look last night when I mentioned the fires. And this morning, as I write at 8:45 a.m. Paris time, both leading newspapers here -- Le Figaro and Le Monde are headlining stories about September 11th. France has not forgotten, either.